The Production Schedule Report prints a list of items scheduled to be produced. These items are entered through orders in the Production Order Entry application, copied from Customer Order Processing, or from MRP Firm Planned Orders. The user may choose to print information based on production transactions that have been posted, or to also include unposted production transactions that have been entered. The user may also determine the data to be printed based on due date/start date, item numbers, and order numbers. The report may be printed for any one location or all locations. * Select the desired mode from the Production Schedule Report menu bar. Enter the location for which you want the report printed. 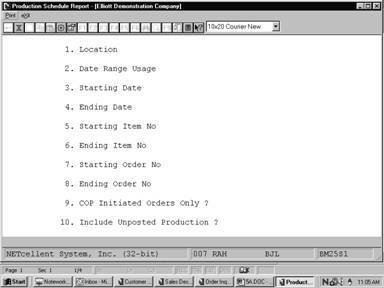 Enter D to print the report based on a range of start dates from production work orders. Enter S to print the report based on a range of due dates from production work orders. Enter the starting date for the range of production orders you wish to print. 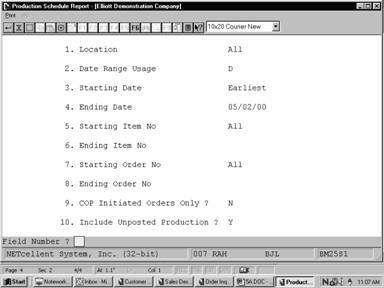 Enter the ending date for the range of production orders you wish to print. Entry is required if the starting date is Earliest, otherwise the default is the starting date. Enter the starting item number for the range of items you wish to print. Enter the ending item number for the range of items you wish to print. Defaults to the starting item number. Enter the starting production order number for the range of orders you wish to print. Defaults to All. Enter the ending production order number for the range of orders you wish to print. Defaults to the starting order number. 9. COP Initiated Orders Only? Enter Y to only include orders copied in from the COP package. Enter N to include all production work orders. Enter Y if you wish to include production transactions, which have not been posted. Enter N to include only posted production transactions. Defaults to Y.